Thank you for viewing Abrahamson & Abrahamson, Estate Planning, Probate and Guardianship Lawyers for the Treasure Coast including Stuart, Port St. Lucie, Okeechobee and Vero Beach, Florida. 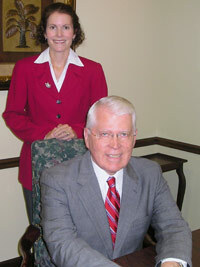 Abrahamson & Abrahamson is a law office consisting of Dale and Andrea Abrahamson, a father and daughter partnership. We are lawyers whose practice is concentrated in the areas of estate planning, probate and guardianship law. We also have extensive experience in the preparation of United States Estate Tax Returns, Form 706. Dale was graduated from William Mitchell College of Law in St. Paul, Minnesota. He has been a member of the Minnesota Bar since 1970 and a member of the Florida Bar since 1974. Dale opened the Abrahamson office in Stuart, Florida in 1986. Andrea was also graduated from William Mitchell College of Law and has been a member of the Florida Bar since 2000. Material presented on the Abrahamson & Abrahamson website is intended for information purposes only. It is not intended as professional advice and should not be construed as such.